Aside from regularly learning his sefer, to what degree do you feel drawn to follow the derech of the Me'or Einayim? 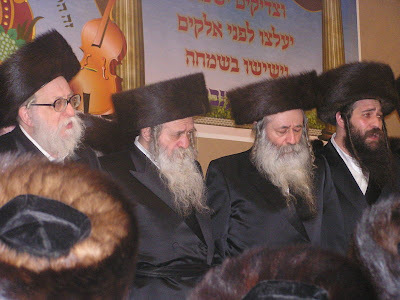 Have you ever contemplated attaching yourself to one of the Chernobyl dynasties, adopting Chernobyl minhagim, or even attempting to follow some of the Hanhagos Yesharos that are recorded and appended to the back of Rebbe Menachem Nachum of Chernobyl's sefer? To be honest, I do not feel drawn, to a great degree, to adopt or discover the minhagim of Chernobyl. I sense that at this point in my life, you and I think pretty differently from each other on this general issue. While you, my holy friend, tend to work on serving Hashem partly through connecting more deeply with your ancestors' mesorah and minhagim, I'm taking a generally different approach. I think you share this approach in common with Rabbi Shlomo Slatkin. Both of you greatly desired to know more about your roots and worked for a long period to time to reach your goal. And then when you learned where you came from, you learned everything you could about the minhagim of that place and then adopted those minhagim forthwith! I greatly admire both of you for this approach. For the time being, I would feel hypocritical and insincere if I were to take on the external minhagim (in davening, Shabbos/Yuntif table, chumros, dress, etc.) of such a holy community without even attaining the basics of where I should be on the inside. As I understand it, the most important part of Chassidus is what's on the inside (behavior, thoughts, emunah, speech) as Rabbi Tal Zwecker writes about. While I know that acting in a certain way externally is a positive way to produce an internal effect, it also has the danger of allowing one to feel "religious" without having to do the real work, which is internal. I'm concerned that I could fall into that trap, and so right now, minhagim-wise, I'm sticking to the original Ashkenaz minhagim that I learned while I was becoming religious. As I wrote about here, while I am inclined to change my minhagim at some point to reflect my connection to Chassidus, my current feeling is that I will hold off on that until I can feel that I won't be putting on airs or acting more religious than I feel that I actually am on the inside. I had a discussion once with my Rav on the following point. Some research by a cousin showed "our" extended Miller family in Europe to have been Sanzer Chassidim (or offshoots like Bobov). However, in the US, starting with my grandfather A"H, my immediate family joined a Nusach Ashkenaz shul and davened there that way. So what tradition should I follow as regards nusach? Not only that, but prior to the Chassidic movement, the whole extended family no doubt used Nusach Ashkenaz. The Rav thought it most approprate for me to follow Nusach Ashkenaz, as begun by my grandfather. I don't feel that using this nusach disconnects me in any really significant way from the family heritage. Bob, I hear that. And that's why I don't feel bad about staying with Nusach Ashkenaz now. The most important thing is pnimius anyway. And IY"H, when I feel the time is right, perhaps I will change over my minhagim. But right now, I do not think that I am ready or worthy of that change. In fact somone sent a letter to Reb Moshe and he said to stay with Ashkenaz since they where first and anyone going to Daven Ashkenaz is Acctualy doing what their Great great Grandparents where doing. Thank you for the post. There are many different ``gates`` to heaven as is known. The ARIZA`L composed a nusach that includes all. However halachicaly speaking there is a debate amongst the poskim as mentioned in the other comments. Reb Yaakov zt`l was qouted that if one wants to swich he should adopt nusach ARI. I have Rebbeim who daven Nusach Ari as well. But even Nusach Sefard *is* Nusach Ari. It's just a different version of Nusach Ari than the one which we commonly call Nusach Ari today, which was "codified" by the Baal HaTanya. We'll see when the times comes. He expressed his view, but chasidim have another, based on the Baal Shem Tov and his talmidim. If someone is drawn to Chasidus - it's up to him to decide, how much he is drawn to it, i.e. if he (she) is ready to follow what tzadikim advised to do.
. But even Nusach Sefard *is* Nusach Ari. Not so simple. Look in "Tfilas Chaim" from Reb Daniel Rimmer for an extensive overview of this subject. "Not so simple. Look in "Tfilas Chaim" from Reb Daniel Rimmer for an extensive overview of this subject." If one adapts R. Rimmer's methodology (which has strength's) then "Nusach Ari", as in the Nusach as the Ba'al HaTanya reconstructed it, isn't Nusach Ari either either, strictly speaking. Yirmeyahu: Strictly speaking it is not even according to Ra"d Levut in his Shaar haKoylel (i.e. Baal haTania has things which are not according to Ari za"l). Even thought I don't agree to everything that R' Rimmer says about how mekubolim Ashkenazim made their sidurim of Nusach Ari (i.e. I think they applied tikuney Ariza"l intentionally to Nusach Ashkenaz (as a base), the fact that R' Rimmer has a hard time with). It is my impression as well that this was done intentionally. As I read it R. Chaim Vital identified the nusach of Shas as the "sha'ar hakollel", "However that which was based upon the ruling explained in the Talmud, this is something that is equal for all souls, and there is no difference in them at all for all the tribes. Unless there is another place this is discussed I think it is inferred that the the Nusach of the Ari serves as the "sha'ar hakollel" for the rest of tefillah as well. I think it was taken for granted that R. Chaim Vital didn't document the Ari's approach, which was shall we say innovative, just out of curiosity. On the other hand he warns against changing one's tradition. As such it would make sense that there would be different approaches on how to approach implementing the Ari's nusach. It's not a clear cut issue. Not to repeat but I think Reb Moshe may have said it best when he wrote, "And I don’t know a clear reason on what basis they were permitted to change their established Nusach....At any rate there isn’t basis for us to complain against those who changed because it is certain that there was a reason which permitted them to change it." "He expressed his view, but chasidim have another, based on the Baal Shem Tov and his talmidim."